MetroRapid holds up to 101 people and can make traffic lights stay green longer if running behind schedule. The new buses will also have designated lanes throughout portions of the city. "The combination of the two” – signal priority and express lanes – “all aims to add substance to the word 'rapid,'" Iannello said. The new bus system will have two routes and 77 stations; one runs from the northern Tech Ridge Center to the Southpark Meadows shopping center. The other route travels from north Austin’s Domain area to Westgate Mall off South Lamar Boulevard. Passengers can validate their tickets at one of the two ticketing machines in MetroRapid buses. All MetroRapid bus stations will display the time of arrival for the buses. Another technology being implemented in the new bus system is a mobile ticketing app. "You will have the ticket on your phone, and activate them when you are ready to use them," Iannello said. Passengers can validate their tickets at one of the two ticketing machines in MetroRapid buses. According to Dottie Watkins, vice president for bus & transit service, the fare for Metro Rapid will be decided in September along with the agency's budget for the next fiscal year. 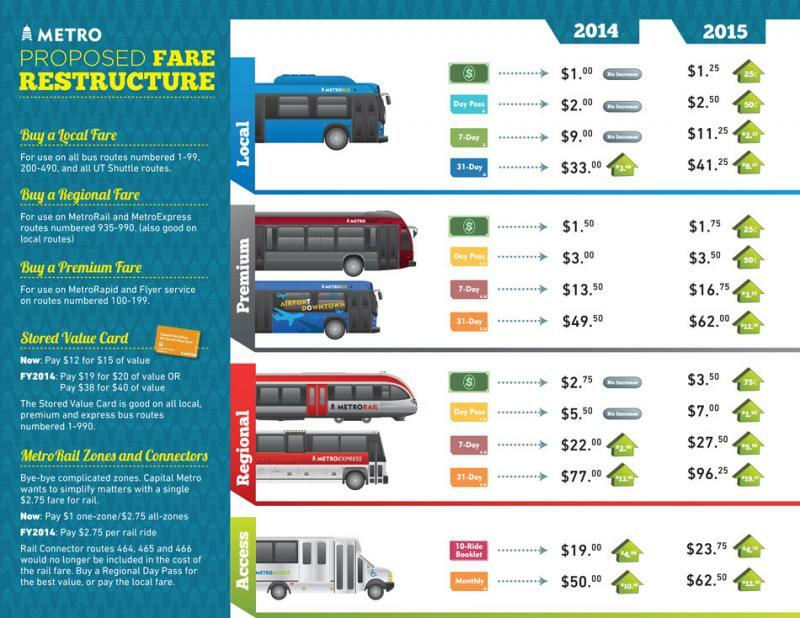 If categorized as a premium service, the fare will be cost more than regular buses. Scheduled to run starting early 2014, MetroRapid was funded by a $38 million federal grant. You may have to dig out another quarter to board a bus in Austin. Capital Metro Transit Authority met today to hear a proposal that could bump up fares over the next two years. Though the transit board won’t approve anything until September, the possible move to raise rates by 25% could net as much as $2.2 million annually.